Chlorphen-12 comes as an extended-release (long-acting) tablet and is usually taken twice a day in the morning and evening as needed. Follow the directions on the package carefully, and ask your doctor or pharmacist to explain any part you do not understand. Take Chlorphen-12 exactly as directed. Do not take more or less of it or take it more often than prescribed by your doctor. Check nonprescription cough and cold product labels carefully before using 2 or more products at the same time. These products may contain the same active ingredient(s) and taking them together could cause you to receive an overdose. This is especially important if you will be giving cough and cold medications to a child. If you are giving Chlorphen-12 to a child, read the package label carefully to be sure that it is the right product for a child of that age. Before you give Chlorphen-12 to a child, check the package label to find out how much medication the child should receive. For children under 12 years, ask the doctor. Swallow Chlorphen-12 tablets whole. Do not break, crush, chew, or open them. Other uses for this medicine. What special precautions should I follow before taking Chlorphen-12? Tell your doctor and pharmacist if you are allergic to Chlorpheniramine or any of the ingredients in Chlorphen-12. Check the package label for a list of the ingredients. Tell your doctor and pharmacist what prescription and nonprescription medications, vitamins, nutritional supplements, and herbal products you are taking or plan to take. Be sure to mention any of the following: other medications for colds, hay fever, or allergies; medications for anxiety, depression, or seizures; muscle relaxants; narcotic medications for pain; sedatives; sleeping pills; and tranquilizers. Tell your doctor if you have or have ever had asthma, emphysema, chronic bronchitis, or other types of lung disease; glaucoma (a condition in which increased pressure in the eye can lead to gradual loss of vision); ulcers; diabetes; difficulty urinating (due to an enlarged prostate gland); heart disease; high blood pressure; seizures; or an overactive thyroid gland. Tell your doctor if you are pregnant, plan to become pregnant, or are breast-feeding. If you become pregnant while taking Chlorphen-12, call your doctor. If you are having surgery, including dental surgery, tell the doctor or dentist that you are taking Chlorphen-12. Ask your doctor about the safe use of alcohol while you are taking Chlorphen-12. Alcohol can make the side effects of Chlorphen-12 worse. 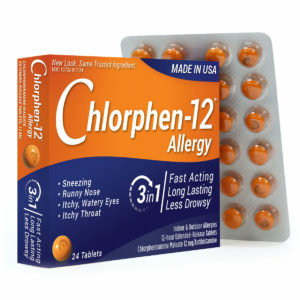 Chlorphen-12 is usually taken as needed. If your doctor has told you to take Chlorphen-12 regularly, take the missed dose as soon as you remember it. However, if it is almost time for the next dose, skip the missed dose and continue your regular dosing schedule. Do not take a double dose to make up for a missed one. If you experience a serious side effect, you or your doctor may send a report to the Food and Drug Administration’s (FDA) MedWatch Adverse Event Reporting program online or by phone [1-800-332-1088]. Ask your pharmacist any questions you have about Chlorphen-12 or chlorpheniramine maleate. 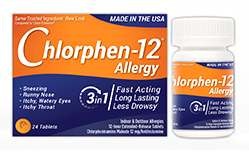 Use Chlorphen-12 for All-Day Allergy Relief. Chlorphen-12 is the only FDA-approved chlorpheniramine maleate, 12mg extended release tablet available in the market today. Prior to 1976, chlorpheniramine maleate was available as a prescription drug that provided powerful allergy relief. Now, many decades later, this tried and true ingredient still provides that same All Day Allergy Relief, without the prescription, in a unique extended-release formulation. See how Chlorphen-12 compares against Chlor-Trimeton, Benadryl, Claritin, Allegra and Zyrtec. Only one allergy medicine is fast-acting, long-lasting, less drowsy†, extended release and available in the US. The best allergy medicine out there by far! For the past 15 of my 24 years, I've been taking antihistamines for allergies. I'm allergic to mold, pet dander, mildew, dust and pollen, which cumulatively seems to make me allergic to life. It all started with Allegra, Zyrtec, and Claritin, and nothing worked. Finally my doctor gave me a RX called Bromfed. Worked like a charm. Sometimes I'd pickup my refill and it would say Bromfenex instead. Then, after 10 years of taking it, one day I went to the pharmacy to pick it up and they told me it had been discontinued. WHAT?! I was beside myself. How could they do that to me? After a lot of googling, I decided to order Chlor-Trimeton 12-hour. Super expensive compared to my 3-month, insurance-subsidized Bromfed RX. But lo and behold, it works. I love this product because it's cheaper and doesn't become unavailable like the name brand one seems to. Subscribe For Coupons and Offers!